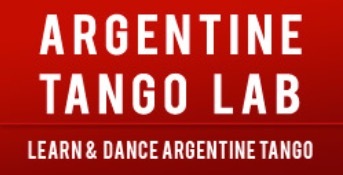 A rgentine Tango Lab started in Vancouver with the idea to become a dance ‘laboratorio’ for all dance lovers who would like to learn the Dance of Embraces, Argentine Tango, in the way is taught in Buenos Aires. The company was founded in 2011 and since then has been involved in various festivals, shows and events not just in Vancouver, but also in US, Europe and Buenos Aires, Argentina. Gabriel and Sigita are offering group classes, private classes and workshops that are held through out the year. Argentine Tango is our passion. It’s who we are. Our approach is to share the experience we have and to help each student by personalizing our teaching and adjusting it to each person’s individual needs. We always start with correct and strong fundamentals that will build students confidence and elegance on the dance floor in any milongas. We focus on quality, connection and self expression in dance. It is important for us to create a warm and welcoming atmosphere for our students and, the more they advance, to challenge and encourage them to explore the possibilities in dance. The progress of our students matters to us which is why we carefully prepare our classes to ensure they will clearly understand the material of tango elements, musicality and improvisation. We are also running our weekly guided practica to help students to improve their dancing. We strongly believe that each of us has a dancer inside us. We would love to share our passion with you and guide you on your journey of getting to know Argentine Tango. 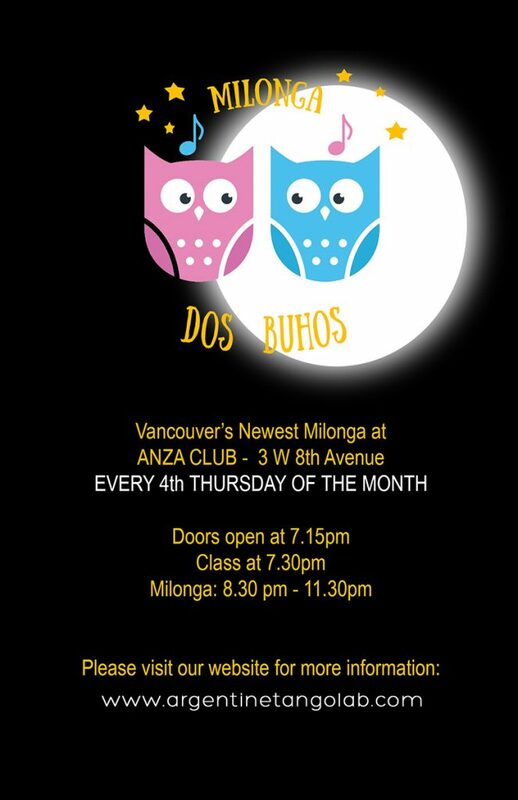 After a wonderful opening Night last month, we would like to invite You to our 2nd Milonga Dos Búhos! Join us for a night full of great music and friendly, cozy Buenos Aires vibes! This time we will be enjoying special chocolate treats and simply magical Argentine Tango tunes with DJ Eric! Music: We will be enjoying traditional and new Argentine Tango music. Venue: Anza Club conveniently located at 3 West 8th Ave, Vancouver. There’s lots of parking in the neighborhood! Class: Argentine Tango Technique class with Gabriel. No partner required. Level: Experienced Beginner to Intermediate. Snacks: Delicious snacks and treats for everyone! Water provided as well. Dress code: make your night special – wear what inspires You! Looking forward to seeing You!